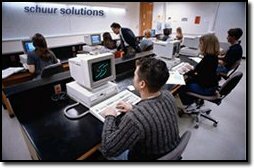 Schuur Solutions offers specialized workshops to assist users. Workshops include hands-on training on all of our product applications. If you think your business needs are specific and you would like tailored training classes, we provide onsite customized training and education. One of the key aspects of a successful implementation is training. Users who have been properly trained are able to make a rapid transition to new systems and utilize the full power of the software. Attending a Schuur Solution workshop gives you the knowledge and confidence necessary to implement your business application quickly and efficiently. Our Instructors have extensive experience and knowledge with the product and the material provided. Our education and training enables you to train others while furthering your own knowledge in the field.